The Mantra. Be Proactive! Be Positive! Add Value! Share Opportunity! To kick off the ITCareerToolkit.com website, I offer this quick but powerful idea. 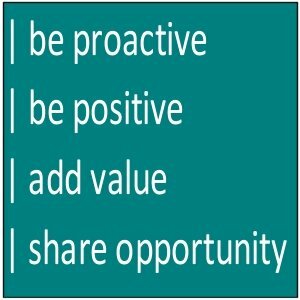 During some coaching sessions this past year, specifically when talking about “Online Presence” and its positive or negative impact on your career, I arrived at these four admonishments. Happen to what you can, respond appropriately to what you must. You have more control than you might realize. Not unrealistic but forward-thinking. To the people in your life. To your network. To the world. Opportunities cross your path where you aren’t the right fit. Pass those on to others. You will remain top-of-mind when opportunity crosses other people’s path. That summarizes a lot of what I believe, teach, and try to live. That is what the aim of this site will be. If you want to get the most out of this site, my advice is to take a similar approach. To me companies utilize many acts of what they are looking for in prospective job seekers. My question is, do I have what it takes to fulfill some or all of their requirements. As I approach different job requirements, I take a long look at my self and ask the question of, is this me, or is this what the company need to fulfill a position. I would like for technology learned areas to fit what the company is looking for and not so much as to what I am looking for. And that’s due to the fact that I change as well as the company changes. That’s the way it is in corporate America. Companies make the choice to down size, outsource, and re vamp their department heads. Its call thinking outside the box. Its a must.